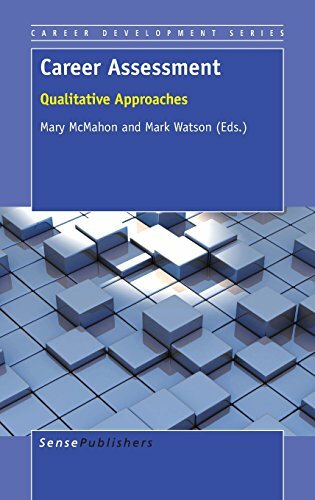 Amazon.com description: Product Description: Career Assessment: Qualitative Approaches will assume a seminal place in the field of career development as the first book to focus solely on qualitative approaches to career assessment. This book represents a timely and important contribution to career development as it seeks to meet the needs of increasingly diverse client groups. Part 1, Foundations strongly positions qualitative career assessment in its historical, philosophical, theoretical and research contexts. The book is innovative by considering qualitative career assessment through the lens of learning. Part 2, Instruments, presents the first collation of chapters on a comprehensive range of qualitative career assessment instruments and processes written to a standard format to enable readers to compare, contrast and evaluate approaches. Part 3, Using quantitative career assessment qualitatively, mitigates against depicting an unnecessary divide in the field between quantitative and qualitative career assessment by considering their complementarities. Part 4, Diverse Contexts, considers qualitative approaches to career assessment in contexts other than able western, middle class settings. Part 5, Future Directions, reflects on the chapters and poses suggestions for the future. With high profile authors from nine different countries, the book represents a truly international contribution to the field of career development. In its focus on qualitative career assessment, this book holds a unique position as the only such text and will therefore assume an important place in the libraries of researchers, academics, and career practitioners. About: Career Assessment: Qualitative Approaches will assume a seminal place in the field of career development as the first book to focus solely on qualitative approaches to career assessment.